Like a bazillion other moms, I’m “in to” essential oils. I’m a member of the original for-the-masses company and it has been super interesting seeing what’s around on the internet to either build up or discredit that company. Very little of the negative information comes from research-based arguments; there’s more research on the pro-side but again, not a substantial amount. People are not making decisions about essential oils based on scientific research. The same can be said for education at times. For classroom instruction, publishers push that their products are “research-based” and therefore must be great for learning. But what research are we talking about? I get especially leery when a program claims this but then there’s no set way to use the program. Which part was researched? By whom? We want to think that research is performed without bias but we’re human. Action research, especially, can be affected by the teachers who do it. What to do? Well, read, read, read. Where to start? Here are two resources that I enjoy browsing; they’ve done the work for you. The Institute for Education Sciences, sponsored by the U.S. Department of Education, reviews research about different programs and summarizes the studies. They do not do original research themselves. They have a nifty little graphic that shows the possible gains or losses through using the materials. 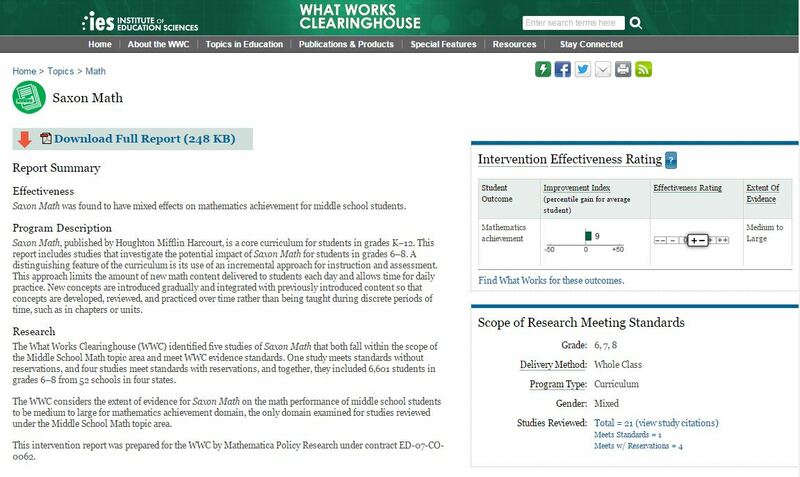 Example of WWC data, this one for Saxon Math at the Middle School level. Visible Learning is a meta-study of all sorts of other studies about teaching practices, materials, and environments that impact learning. John Hattie developed a barometer to reflect the possible growth shown in studies. It is super interesting: what is shown to be effective on paper is not necessarily what you would expect. Teaching practices with the greatest effect size according to Hattie. Both of these resources have informed my practice and my students are growing. What other resources are out there to help teachers make informed instructional decisions?